CLEVELAND -- It used to be LeBron James' favorite little corner in the NBA, the place he felt safest and happiest and most at home. It's the space right in front of the Cavaliers bench and along the nearby baseline. For James, more emotional moments have unfolded in that spot than in all of the gyms across the country and around the world. He has celebrated uncountable great plays there -- flexing his muscles, and smiling or growling with delight. He's danced there. He's posed for fake pictures with his teammates there. He's held his son on his lap there. He's embraced his buddies and bosses who had season tickets there -- everyone from Jay-Z to Warren Buffett to Phil Knight. He kissed his mother there on his way to the locker room after winning the Eastern Conference title. On Thursday night, in a hot and venomous crucible, it was both surprising and understandable that it was where he found comfort and shelter. Right in front of the Cavs bench and owner Dan Gilbert's courtside seats, James found his Most Valuable Player groove that has largely been missing during his time with the Miami Heat. James was masterful in his return to Cleveland in the Heat's 118-90 win over the Cavs. It was far and away his best game since he joined Miami and perhaps one of the best regular-season performances of his career considering the unique circumstances. Simply and oddly, James looked like a Cav again. "It was impressive," Heat coach Erik Spoelstra said. "It takes a special player and a person to be able to respond to all of this scrutiny." James responded by celebrating many of his baskets, the return of his jumper and the consequences of his decision precisely at his favorite spot. He followed shot after shot in a stunning third quarter, during which he scored 24 points on a dizzying 10-of-12 shooting. James gestured and yelled at his old teammates. He made faces toward the owner's seats as he swaggered upcourt. It was what he's always done, and without any apparent fear of retribution from a stunned Cavs team, he fell right into his old habits. The hotter he got, the more demonstrative he was, zipping past the bench with his head bouncing and his eyes rolling. "It was seven great years here," James said afterward, basking in his 38-point night. "A lot of memories here." One memory James didn't seem to remember was the last time he was in that corner. Sitting on the end of the bench for the last minutes of the Cavs' humiliating Game 5 loss to the Celtics last May, he and Gilbert were 10 feet apart but never looked at each other. That game was one of the worst of his career. He and his team failed on a massive stage, and James ultimately left Cleveland. The stakes weren't the same on Thursday but the pressure felt just as intense. This time James delivered a superstar performance, all of which made the celebrating harder to watch for the overly emotional fans -- and perhaps the Cavs players. "I know those guys, and we've had a lot of battles on the same court," James said. "So it was fun to have an opportunity to go against them." Before the game several Cavs, including former friend Mo Williams, shunned James as he tried to come over to the bench to greet them. During the first half, James wandered over to talk to the bench only to have several players completely ignore him. Others, including friend Daniel Gibson, treated it like it was 2009 as they chatted James up. By the third quarter, when James was on fire and the game was getting out of hand, the only reaction came from Anderson Varejao, who swiped James' headband off his head and tossed it aside when James was brazen enough to again step over to his favorite spot. "I really didn't see that," Cavs coach Byron Scott said, perhaps trying to be pragmatic on a night when his team had many other problems to examine. It is hard to believe that Scott, a veteran of the Celtics-Lakers wars, could endorse such behavior. "I'm not really worried about that," Scott said. "That stuff is what he does most games." This was not most games. This was one of the most demanding moments of James' young career. Cleveland used the evening to speak to him. Early in the game, the crowd poured out pain in waves of noise with more energy than has ever been felt in Quicken Loans Arena. James answered the fans by reminding them what they'd lost and did it the same way he'd won them over. Right down to the few square feet he made a centerpiece of during his days as a Cav. "I'm satisfied and happy right now," James said. "I understand [fans'] frustration. But I'm moving on." CLEVELAND -- Maybe not to their coach, but to most Cavaliers players and fans Thursday night was like a playoff game. But in the wake of the 118-90 loss to former teammate LeBron James and the Heat, it may have felt like it was a loss in a playoff series. With so much emotion and anticipation put into one night -- a rare situation for an early December game -- the Cavs' being blown out at home was a major blow to the supportive fan base and the hopes for the immediate future. Players couldn't have felt good, even though coach Byron Scott was trying to find a way to stay positive after allowing 57 percent shooting. "We're going to keep on working and fight," Scott said. "It's still very, very early in the season, so we still have a long way to go." What was most discouraging was the performance of players the Cavs are counting on this season in order to have a chance to make the playoffs. After not making a basket against the Celtics on Tuesday, prospect forward J.J. Hickson managed just six points and four rebounds Thursday. Guard Mo Williams, who amped up the local excitement with comments in the media over the past several days, was just 2-of-8 shooting in what was a reminder of his playoff struggles the past two seasons. Antawn Jamison started the game 1-of-7 shooting as the Cavs fell way behind. The only player who could feel good about his performance was Daniel Gibson, who had 21 points. By the end of the night, fans who came hoping their team would deliver an emotionally uplifting win that might carry them through the winter became restless. In the fourth quarter, upset fans got in skirmishes around the arena that took the attention off the court and into the upper decks. The Cavs said just one fan was arrested. "We didn't play good at all," Anderson Varejao said. "We lost by a lot, but we'd have the same issues if we lost by one." ESPN.com writers and TrueHoop Network bloggers chatted with fans and gave their in-game opinions throughout Wednesday's games -- all in Daily Dime Live. Should he blow up the team because the best player left as a free agent? Or should he try to grind through a season with what's left, hope it's good enough to eke into the playoffs and try to rebuild the pieces from there? That was Cavs owner Dan Gilbert's dilemma in the wake of LeBron James' departure, and once he finished his project to permanently remove the comic sans font style from the PR playbook of every corporation in America, he set about with the latter plan. Unlike in 2003, there would be no tanking. The Cavs would try to get by without their star and make the best of it. It was an interesting choice, because for a lot of NBA teams, selling hope is 90 percent of the game. It's not necessarily about being good or bad, in other words, but about the ability to excite fans regarding a team's eventual ability to be good. The Clippers, for instance, may stink, but with Blake Griffin dunking on people's heads and Eric Gordon going gangbusters, it's easy for them to sell hope. In contrast, one reason James' departure left Cleveland so shell-shocked is that the franchise appeared to have little hope for the future without him. While the franchise has gamely ambled along at 7-10 this season, much of that concern remains. The team is projected to finish 30-52 according to today's playoff odds, which assign the Cavs only a 9.1 percent chance of making the postseason. Cleveland has been outscored by more than five points a game, which normally is a recipe for losing 50 games, and its schedule to date hasn't been particularly difficult. • Click here to read the rest of Hollinger's PER Diem for Thursday. LeBron James, Heat: The King has returned ... and not just to Cleveland. In just 30 minutes of court time, James had arguably his best game in that new shade of red, scoring a season-high 38 points (on 15-for-25 shooting) to go along with eight assists and five rebounds. Zydrunas Ilgauskas, Heat: Unlike his much-jeered counterpart, Big Z was welcomed back to The Q with open arms. But the Cavs' franchise leader in games played barely showed up at his old stomping grounds. Ilgauskas was the game's only starter to be held scoreless; he didn't attempt a field goal or free throw all night. "I understand their frustration. I understand things could've been different this summer from both sides. But I'm moving on, and I'm happy in the position that I am." • See Thursday's NBA leaders. CLEVELAND -- He got a firm grip, locked in on the target, took aim and launched his shot with about seven minutes left in the game on Thursday night at Quicken Loans Arena. It would be the last shot he took on behalf of the Cleveland Cavaliers that night, so he intended to make it a good one. By then, his team was already being spanked by 30 points. Frustration was setting in, and the last thing he wanted to see was LeBron James -- or "LeQuitter," as he was shouting at the time -- smiling at the end of what quickly turned into a laugher of a homecoming for James. This time, it turned out to be a knotted rally towel, which fell about 2 feet short of striking James before it was swatted down by a Heat security officer. Maybe that fan, who was quickly whisked out of the arena with a Taser gun aimed at his back by police, wasn't aiming at James after all. LeBron announced on July 8 that he was joining Dwyane Wade and Chris Bosh in Miami and signed his free-agent contract on July 9. But Dec. 2 should go down as the day he officially laid a foundation with his new basketball family by torturing his old one with 38 points, eight rebounds, five assists, one block, a steal and no turnovers in 30 magnificently efficient minutes. Looks like Shaq picked the wrong bet. 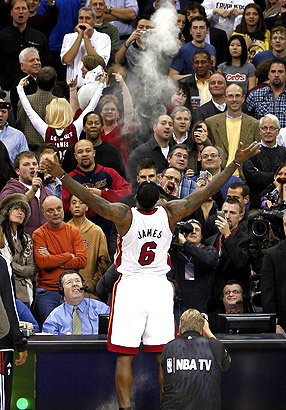 Despite pregame doubts, LeBron went to the announcers' table at The Q and tossed up the talcum powder. The talent of the Heat's Big Three of Dwyane Wade, LeBron James and Chris Bosh was on display Thursday night against a clearly undermanned Cavs squad. Despite only playing 19 minutes on the floor together, Miami was plus-25 with the Big Three on the floor.